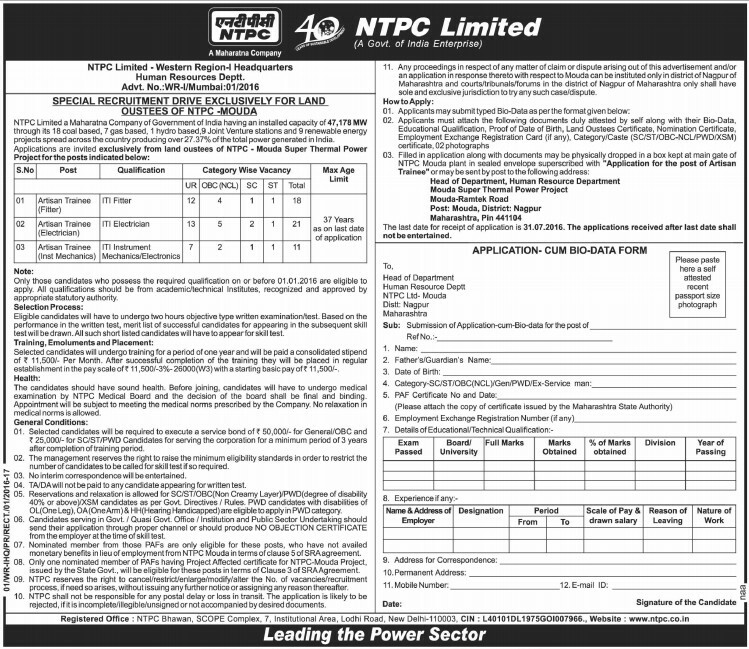 National Thermal Power Limited (NTPC) has invited applications for Recruitment of filling up 50 Artisan Trainee (Fitter, Electrician and Mechanics) Vacancies. Interested and eligible candidates are advised to apply online for NTPC Mouda Recruitment 2016 at www.ntpc.co.in on or before closing date 31st July 2016. Candidates who wish to apply for NTPC Mouda Recruitment 2016 need to visit NPTC website www.ntpc.co.in. Fill the application form as per guidelines provided in notification, deposit the application fee. After successful submission take a print out of system generated application for further process of this recruitment. Filled in application along with documents may be physically dropped in a box kept at main gate of NPTC Mouda plant in sealed envelope super-scribed with “Application for the post of Artisan Trainee” or may be sent by post to the following address – Head of Department, Human Resource Department, Mouda Super Thermal Power Project, Mouda-Ramtek Road, Nagpur, Maharashtra, Pin-441104.